The Boston Globe reports that The Girl Scouts of Eastern Massachusetts celebrated the organization’s first century by hosting the Forever Green Gala on March 28 at the Fairmount Copley Plaza hotel. U.S. Secretary of State and Girl Scout alumna Hillary Clinton sent her regards via video. “I learned my first lessons in leadership as a Girl Scout, and the values I learned are the values I still maintain,” she said. 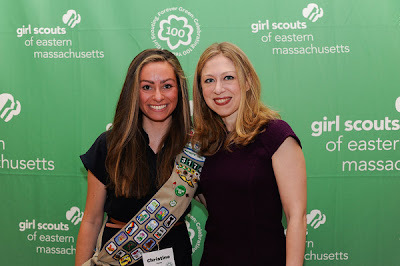 Girl Scout alumna and guest of honor Chelsea Clinton followed her mother’s video, speaking to the guests from the stage and later participating in a question and answer session with a few Girl Scouts. “I learned a few core lessons as a Brownie, one of those being the value of teamwork and everything that we girls can do when we work together,” said the younger Clinton. In other news, U.S. Secretary of State Hillary Clinton has been in the headlines lately for the wildly popular Texts From Hilary meme.